It has been very productive weeks. We now have permit from VS and restoration has began. Amazingly damaged roof is removed and new flat roof is already placed in just few days..
On April 11th, at the Nassau County Fire Marshal variance hearing, Fire Committee has approved our new down draft Hibachi grill system to be installed at Inatome Japanese Steak House. Our Hibachi grill team is now in full motion to design safe and clean system to custom fit our building. Thank you all for working so hard! As for our restaurant, I'm still waiting for the permit from VS building department and my team is currently in stand by position. The permit involves with not only our blue print detail of structure but they need to know our layout of electricity, HVAC and exhaust system in detail. And this process has been slow us down to prepare the plan and come up with detail drawing and so on. Simultaneously we are working with Nassau Fire Marshal and we have just had scheduled to have variance hearing on April 11th to present our brand new Hibachi grill (down draft system). Having this sophisticated Hibachi system, it will reduce greatly with noise, smoke and smell. We can have very clean and healthy environment and it will be our core foundation to operate our new Inatome Japanese Steak House. Although the system is allowed to most of states and counties, it is new to Nassau County. It is therefore takes extra effort and my team is doing their best dealing with Nassau County. FM department is in positive attitude and cooperative to our project and I do not anticipate problems at this point. But of cause we wish to speed up this process. For those of you requesting Sushi bar at Inatome, we realized there are only limited Japanese owned Sushi restaurant in South shore and we would like to take this opportunity to extend our menu to offer real Japanese Sushi and other authentic Japanese menus to cater our local community. Simultaneously, we are seeking for possibility on take out services. As for our employees, they are all dealing with their situation individually to support their families and we are in touch exchanging information. I’m wishing them all continue to do their best and I believe it is my responsibility to have them returned to operate Inatome Japanese Steak House again. Regrettably our rebuilding process is slow and sometime stressful but I would like to extend our appreciation to all of you. Your support is our key element to our existence. Please keep in touch and I’ll get back to you periodically to update our stand. It has been sometime since my last update to you. Forgive me. However our progress never stopped. Our structure part has been finished and now we are working on systems including electric, pluming, HVAC and fire sprinkler, etc. Each process is served by different contractors and putting together the puzzle can be tricky sometime and few minor set back and adjustments are made to make it right. But we are getting there slowly but surely. It has been a quite experience for me. I'm packed with experiences now. We choose to contract out the work to local venders and team up working hard to restore Inatome Japanese Steak House. For those of you wrote email to us with encouragement and many wishes, Thank you. It is great feeling to know we have so many supports and love from you. Although it is a bit too early to announce our re-opening date and I wish to focusing to take this project one step at the time. Initially I was hoping to open by now but technically the construction only started on April and I'm expecting to continue through out this summer. Meanwhile please take care and have a great summer. I'm sorry for slipping away not updating with our news. We have been busy pushing our team forwarding to next step. We are still working on all required fire systems design and installation. Until then we are holding off with sheetrock. However all our Hibachi tables and other cabinets including Sushi counter and bar counter and other millworks are fabricated at other facilities. We are hoping to get all systems installed very soon and our cosmetic work can be done. Valley Sign on Merick Road is working on our sign light box. We decided to revive our original logo. This logo will be our new face. I'll be reporting with our progress again soon. Thank you for your support. Thanks to my team for hard work. We also start our Facebook this week. Search us at Inatome Steak House. Snow in Oct?! But it was exciting day. Crane pulled up to the parking and unload 30tons HVAC units. Thank you Mike & Anthony from L & M and Mike from Deverio Mechanical working so hard in snow. Also Down draft Hibachi table was placed temporally for Fire Marshal for our presentation. The unit looks so beautiful. Two days ago, I was at VS building department going over old documents. Prior to Inatome Japanese Steak House the building was restaurant and meeting place for locals. The building even had bowling lanes in the basement. I was fascinated but this makes perfect sense that this location has been entertaining locals for over century. So the heritage continues. Thank you all for your support. I'll report you with more updates. Although we are not quite ready to reopen, some of you might notice we have our outside signage up. We decided to put up while weather is good. We are also please to announce Mr. Hiroki Nagahashi and Mr. Yoshiyuki Oji are back with us! They are now preparing our operation plan including new menu, processing, purchasing and endless list to run INATOME. As for construction, still have a lot more to do but start to shape up and we can't wait to see complete work. Here is updated pictures. I also want to thank you all for wonderful e-mail and posting and become our facebook friend. 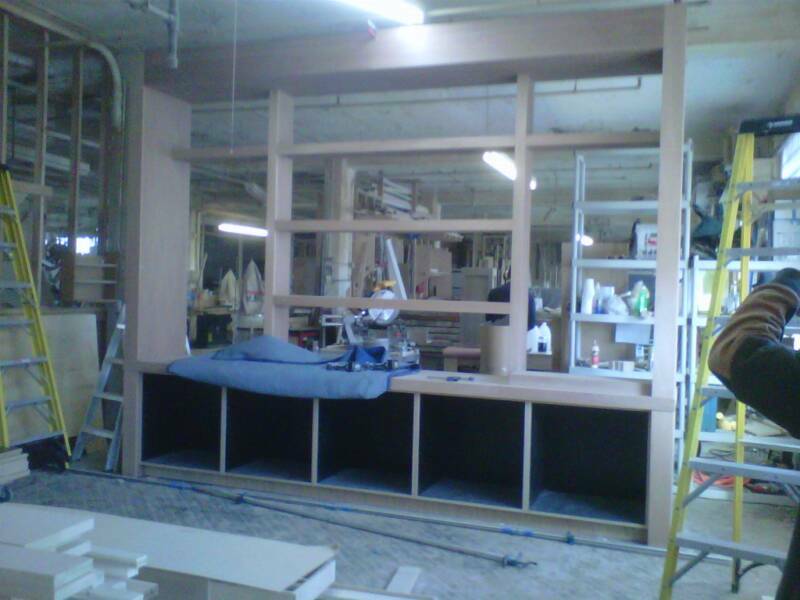 Today our cabinet maker, Shusei Sugawara and his team installed the bar & Sushi cabinet / counter. It came out really nice. Interior construction is in full motion now. I should able to report you with more up date including major progress on suppression and duct works as soon as we have their confirmed schedule date, then we should be able to set our re-open date. Wish us luck! Thank you all for your support. It has been so long but we are now happy to announce that we set the date to re-open in late January 2012. It has been very difficult year for us but with your encouragement, we are rejuvenating and determined to serve you again. Thank you all for your support! Many of you asked us if you can purchase gift certificate, we are now offering the certificate online or at site. You can purchase them with the following buttons and we will mail the certificate to you via Priority mail (no shipping charge for over $100). Or if you wish to purchase at our restaurant, you are welcome to visit us and we will issue the certificate for you at site. (For at site purchase, please visit during 9am to 6pm Monday to Friday. We currently can only accept cash or check at our location.) Thank you and have wonderful holiday seasons. It has been now more than 14 months since our tragic fire. Two days after the fire, I was able to open my e-mail and found myself with flooded email messages from my loyal customers supporting us to re-open. The same day I had to let go all my employees to ask them find another job to support them and their families. I never felt so much emotion that day. And I promised myself committing to rebuild and open again. Last Friday night, I called in all my people and they all happily accept my invitation to be back with us. This was the happiest day of my life. All the struggle and agony is now past and we are focused to finish our construction and ready to serve you again. Thank you for your compassion and encouragement. We could not make this possible without your support. We will see you very soon. Until then, thank you for your patient. Thank you for your kind messages and your support. Although we announce our re-open day as the end of this month, we regret to inform you our construction (mainly fire systems) has been delay. Our down drafts Hibachi duct and suppression system are all new to local contractor and we need to take time making sure to do the job thoroughly. Our first test from Nassau County Fire Marshal office has pass. However we have two more steps to complete the job and it will take more time than we anticipated. This week we have meeting with our contractor to reschedule our calendar having them enough time to complete their job. We can then re-announce our opening day. We are sorry for this delay and we hope you understand. Please be patient and we’ll get thing done as quickly as possible. Thank you for your friendship and your support. Thank you all for your heart warming message for this Valentines Day. Please accept our apology we could not finish rebuilt the restaurant on time to serve you this special day. As for the construction, we are pushing our construction team to finishing up this week. The permit will be followed. At the same time, we are regrouping our staff and training ourselves to get used to our new system. We can then set confirmed big day. Thank you for your patient but we are almost there now. We could not be here today without your support. Although we were planed to re-open for end of this month, we regret to inform you we need little more time to get our operation running 100% before invite our guests. We know you have been patient but we are almost there. Fire systems are finally finished and all systems are now in operation. We are now able to call officials to inspect our systems. We are currently testing our menu to make sure we can serve you right once we re-open. Hibachi menu will be prepared by same cooks and menu lineup will be unchanged. However we now serve Sushi and Sashimi menu as well as more authentic Japanese dishes with Inatome touch. We are now permitted from the Health department and start getting our ingredient in house to test our new equipment. Our chefs are sharpening the knife preparing for your visit. Thank you for your patients and friendship. I’m happy to let you know our restoration project is now completed. After many sleepless night and hard work, new Inatome turned out incredible. You’ll love your new Inatome as we do. Now we are in process of completing officials to sign off and we are good to go. We are aiming to re-open in few days. If you have not resister your name, please send us your email address. Thank you for your patient and your support. *Thank you for your warm e-mail messages. Currently we have been overwhelmed and cannot reply each one of you. We apologize, we cannot take reservations by email. Please call us to ensure your reservation. It is now 6th nights after re-open. Thank you for overwhelm responses and kind messages. We are gradually adjusting and adapting to our new house. Things are bit more settled and we are getting better serving you. Please e-mail me to let me know how we can improve our service. For the people we could not accommodate you, please forgive us. Give us more time and we'll get to you. Meanwhile, please review East of NYC preview of our restaurant. East of NYC. For those of you coming back to us and new visitors, see you soon at new Inatome! It is now a week since we re-open our door. It has been unreal with overwhelming responses. Honestly, we did not expect this much. Thank you so much for your loyalty! We are very honored to be a part of this community. We feel more responsible now and we pledge to continue this tradition. Please note we are now close Tuesday until further notice. We feel important give a break to our staff member until we develop our new structure and training new people. We also need to finish and maintained our building and make few adjustments. I thank you for understanding and accept our apology for your inconveniences. Thank you again for your friendship and support. Having been destroyed by fire in 2010, Inatome Japanese Steak House has risen again. Now known as Inatome Japanese Steak House & Sushi, the new version is actually two restaurants under one roof, according to manager Keiji Inatome, whose parents, Seizaburo and Katsuko Inatome, opened the place in 1975. They are still the restaurant's owners. 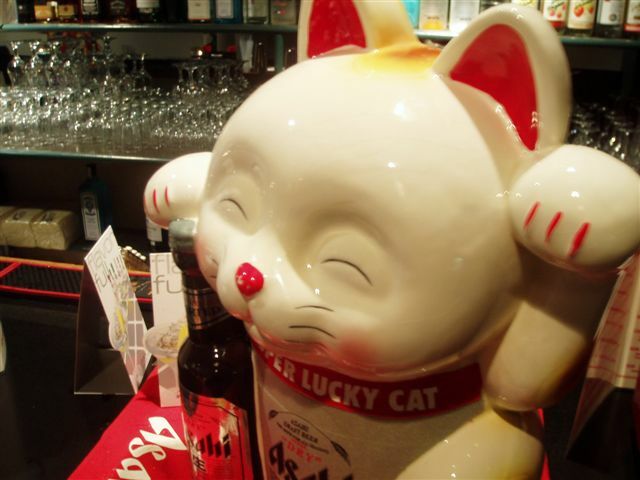 Today, said Keiji Inatome, the restaurant has a sushi bar and serves traditional Japanese fare in a separate dining room under the aegis of chef Hiroki Nagahashi. On the other side is a hibachi area, under the command of chef Yoshiyuki Oji. Here, 11 hibachi tables are equipped with smokeless downdraft ventilation for a safer and smoke-free environment. 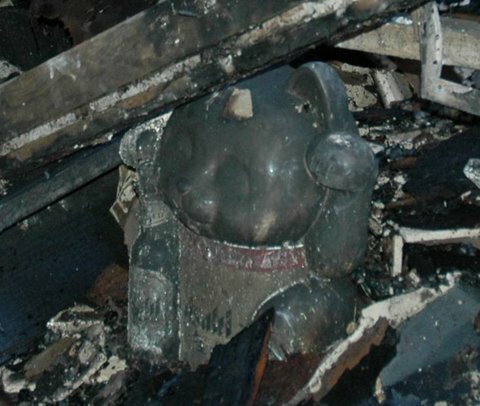 Inatome said he worked closely with the town’s fire marshals to make sure the new system was up to code, although, he added, the previous fire was electrical and had nothing to do with the hibachi tables. Inatome, whose background is in fashion and product design, said he designed the interior of the place, which also has a lounge and bar area. “I was inspired with East-West, old-new, complex and simple,” Inatome said. 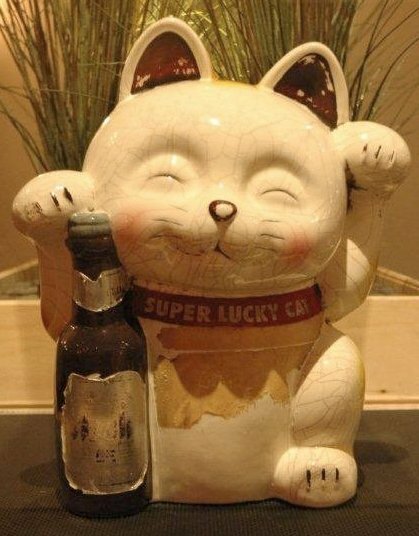 In a place of honor, at the center of the restaurant, stands a porcelain welcome cat “Maneki-Neko,” which survived the fire and continues to greet guests. 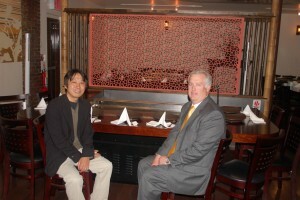 Inatome Japanese Steak House is at 6 5th St., Valley Stream, 516-872-0419. Hibachi at lounge & Zen Plate. Inatome featured on "Restaurant Hunter"